A few months ago, I attended a talk by two NParks staff who talked about Biodiversity on Rooftops in Singapore. This is an exciting concept to me and I quickly form the idea of rooftop habitat gardening. I live on the 18th floor. When I look out from my balcony, I could see a lot of rooftop spaces which can be utilized for rooftop biodiversity. If carefully planned, rooftop green spaces provide wildlife corridors to counteract habitat loss. These corridors allow wildlife to move from one tract of habitat to another. I have visited some rooftop gardens in Singapore, including those of HDB multi-storey car parks They tend to be more of landscape/ornamental gardens. Dull, ornamental, manicured gardens certainly cannot attract a rich variety of wildlife. I really wish to see habitat gardens on rooftops in Singapore. We can garden the rooftop so as to create natural habitats for certain groups of wildlife (such as birds, butterflies, bees, hoverflies, ladybugs, etc.) and at the same time incorporate organic edible crops. There are many well-known benefits of locally grown and organic produce. Yes, I could also see all these difficulties, and more. But, if it is the right thing to do, we should be able to turn the difficulties into opportunities. Well, the Town Council representatives did not turn down my suggestion right away, but said that they would discuss with HDB on this matter and then get back to me. Well, three months have passed, and I have not heard from them anymore. I guess this is their way of saying "No!" to me. I also wrote to our MP. Again, I got no reply at all. In my recent trip to Hong Kong, I visited some organic farms, community gardens and rooftop farms. I was particularly touched when I saw the rich biodiversity in and around this organic farm I visited in Fanling. There are quite a number of organic farms in the New Territories, providing a healthier and safer choice for the Hong Kong residents. Every week, there are a number of farmers' markets in different districts of Hong Kong, where the organic farmers sell their produce directly to their customers. 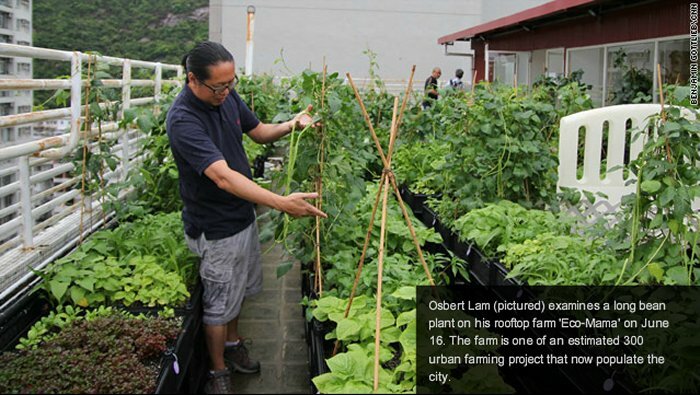 I visited one of these farmers' markets - Organic Farmers' Market@Central, right at the central business district of Hong Kong. This market opens every Sunday. Although small (only about 10 stalls), this farmers' market is very vibrant. The stall holders are the farmers themselves. They are friendly and are happy to answer customers' questions on their vegetables. The stalls do not provide plastic bags. Customers must use their own shopping bags. I am also amazed by the variety of vegetables sold there. Below is a video clip I shot of this small but vibrant organic farmers' market. It is also interesting to read this Malaysian lady's impression of Organic Farmers' Market@Central. Back in Singapore, the only Farmers' market I know of is the one at Loewen Gardens. I do not know if they sell locally grown organic vegetables there.